Epoxy flooring is the obvious choice when it comes to industrial and commercial floors. When it comes to residential areas, however, polished concrete is usually the option of homeowners who want high-shine floors. This seems to be changing as the popularity of epoxy floors makes its way into living spaces. Initially, epoxy became increasingly popular as a garage and basement flooring material. As designers and homeowners recognize the versatility of epoxy, the realization that it’s also an impressive flooring material for other home areas has made waves. If you’re trying to consider one or the other for your concrete floor, here’s why you should choose epoxy flooring. Where there is a comparison, there is, of course, similarity. Both concrete floor options offer a smooth and high-sheen finish with a light-reflective quality. Both are also very easy to maintain. Another similarity is that both these floorings do not promote mold and bacteria growth as they are both hygienic and easy to clean. Where does polished concrete go wrong? 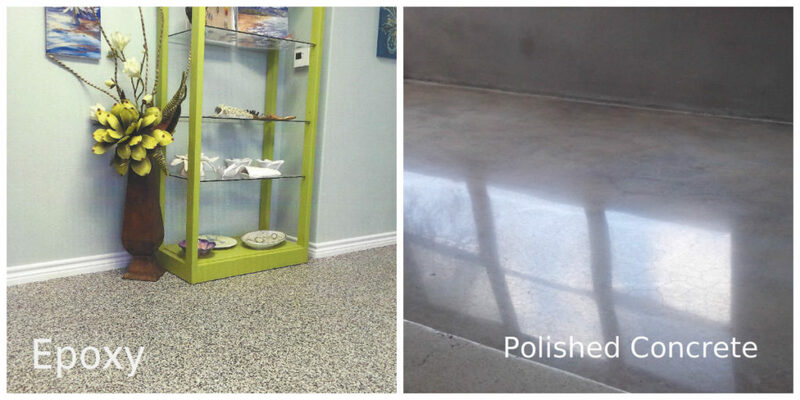 Unlike epoxy resin coating application, polishing does not improve the compressive strength of a bare concrete floor. The design options for polished concrete are limited. Polishing may be a suitable option for newly installed concrete floors but for old flooring with significant damage, it does not provide optimum results. Although polished concrete is light-reflective, it can only increase a floor’s light reflectivity by up to 100%. In comparison, epoxy floor coating increases light reflectivity by up to 300%. Epoxy flooring has the upper hand against polished concrete in more ways than one. An epoxy resin coating is designed as a form of protection for the concrete slab underneath it. It serves as the barrier that protects the structural integrity of the concrete slab against the heavy usage and traffic demands of a demanding environment. Aside from that, epoxy resin coatings are fully customizable. The modern advances in epoxy resin have made it an excellent decorative element. Popular decorative epoxy floor applications include metallic epoxy, 3D epoxy and color flake epoxy. If you want deliberate and uncluttered floors that can elevate any room into a stylish area, epoxy flooring is hands down the best option. For epoxy floors installations and other concrete floor services, call a licensed concrete contractor.